The Jotunheimen range, the home of the giants, lies in the centre of Norway, only two hours north of Oslo by train. The range contains the highest mountains in Norway: at the top of the Galdhøpiggen (2469m) you are at the highest point north of the Tatras and west of the Ural. Glaciers have carved out valleys that lie 800-1400m above sea level and the peaks above are generally 2000-2500m. 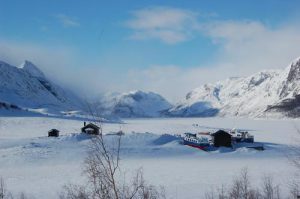 The northerly latitude (60°N, Chamonix is 45°N) makes up for the lesser height of the mountains in terms of snow and this tour gives us a great introduction to skiing in Norway. Extras: equipment hire, extra taxis if required. Meet: Oslo. Train to Otta. Day One: Meet in Oslo and take the train to Otta, two hours to the north. We then have a bus ride of another hour or so to Gjendesheim (1000m), one of the gateways to the eastern side of the Jotunheimen National Park where we sleep for our first night. Note: there is no bus if the road is snowed in - if this is the case then we ski this section. Day Two: After making our way to the eastern end of the Bessvatn lake we begin a long gentle climb to the Bukkehø summit (2258m) from where we look down on the famous Besseggen ridge and the Bessevatn and Gjende lakes. From here we can see much of the route we will be taking over the next five days. We either ski down the western couloir or the ridge, depending on conditions, to arrive at our accommodation in Memurubu (1000m). Day Three: We have a choice of routes today - either via the summer route to the Surtnigssue summit (2368m) or over the glaciers to the Søre Veotinden peak, with perhaps another couple of summits on option should we wish. Various descents on offer, the main one over the glacier being relatively gentle. We arrive in Glitterheim (1500m). 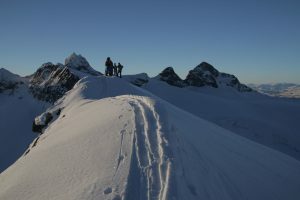 Day Four: In poor weather there is a staked route between Glitterheim and Spiterstulen, but obviously we will be hoping to climb the Glittertind Summit (2465m), and wonderful winter peak. We enjoy a lovely run west down into the Steindalen valley, before another peak and a descent to Spiterstulen (1000m). Day Five: Today is the most challenging day on the tour with a four peaks possible, 17km to cover and 1800m to climb in total. We'll be glad to see the Leirvassbu Lodge when it arrives in view! 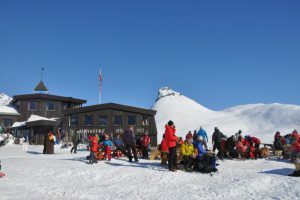 This lodge is the premier winter sports destination in Norway, at 1400m on the shore of Liervatnet lake and beneath Kyrkja peak. We will stay two nights here and take advantage of the surroundings and the day trip itineraries. Day Six: We will see what the weather and snow conditions suggest as options for our day trip from the Leirvassbu Lodge. We might just soak up the atmosphere! Day Seven: the last day of our tour takes us up and over the Storebjørn peak following the route to the east, then down the Leirbrean glacier and into the Krossbu Lodge (1250m), our accommodation for the night. Day Eight: Bus from Krossbu back to Otta and train to Oslo to connect with return flights. As with our entry - if the road from Krossbu to Otta is snowed in and there is no bus then we ski this section back to Otta. To book you can use the on-line booking system below - check the start date and the end date and then proceed. The system will ask for a deposit which you pay using PayPal. Or, if you prefer, you can email us directly (sian@pyrenees-mountains.com), ring directly on +33 5 62 92 81 52 or Skype: sian.grigg.